Well, it was an extremely excited and overwhelmed Drew of Perth, Western Australia when he was phoned by Shaynna and given the fantastic news that he had won the La Germania Cooker! 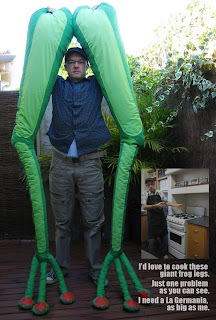 What makes this entry a great winner, is that Drew and his wife spent many weekends actually sewing the giant frog's legs, so their dedication and creativity has really paid off ! Congratulations Drew from all the team at shaynnablaze.com, and also a very special thankyou to our generous sponsor SAMPFORD IXL who donated this wonderful prize. Keep checking back to shaynnablaze.com for more sensational opportunities to win some amazing prizes.